Poor private key management is a common issue in cases of crypto theft. CRYPTOTAG is a premium backup system that solves this problem by immortalizing users recovery phrases in titanium. In 2018 alone more than $1 Billion of crypto was stolen. Most people’s funds were stolen in hacks and scams. Others could not reach their crypto, because they lost their private keys or recovery phrases. One thing all the cases have in common is poor private key management. What are private keys and recovery phrases? And how should you protect yourself from losing your funds? Bear with us while we try to explain it in a simple way. A private key is the most important information in crypto. Without your private key, you cannot access your crypto. You can compare it with the PIN of your debit card. If you have forgotten your PIN or if you have lost your bank card, you can call your bank. Then they will send you a new PIN or a new bank card, and you will regain access to your money. The big difference in the crypto world is that there is no bank or other central organization that can help you recover your funds. So if you lose your private key, there is no one that can help you to regain access to your funds. If you lose your private key, you cannot call anyone for help, and you will lose your coins forever. What Is a Recovery Phrase or Recovery Seed? A recovery phrase is used by crypto wallets like Ledger Nano and Trezor. These phrases or seeds usually contain between 12-24 words. Compared to a private key a recovery phrase is easier to read for humans. But more importantly, is that the use of recovery phrases enables crypto wallets to store multiple private keys with one recovery phrase. For example, you have a Ledger Wallet with Bitcoin, Bitcoin Cash and Ethereum on it. Each coin has its own private key. You do not have to save all those private keys because by making a backup of your Ledger Wallet, you make a backup of all private keys on the Ledger Wallet. This is the riskiest way to store your crypto because your funds are in the hands of a third party. The exchange or custodian is holding your crypto in their wallets. So they control your private keys or recovery phrases of these wallets. There are countless stories about exchanges being hacked and losing funds of their clients. It is ok to have some of your funds on an exchange for trading purposes. Longtime holdings should never be stored on an exchange because you are not the owner of your keys. These wallets like Jaxx, Electrum, and Exodus can be downloaded for free. They enable their users to receive, send and store different types of cryptocurrencies. Software wallets generate private keys. And you can easily make a backup of a software wallet by saving the recovery phrase offline. This means that with a software wallet you are the owner of your (private) keys. A software wallet does have the risk that malware or viruses can cause your software wallet to be hacked. The risks associated with software wallets are solved by hardware wallets like the Trezor and Ledger. The big advantage is that these wallets are secure stand-alone devices that are not connected to the internet. Recovery phrases are used to back up the private keys stored on the devices. Owning a hardware wallet is a great step in securing your crypto because you are storing your private keys offline. The big risk here is the loss of the recovery phase. So you did all the right things. You went online, did your research, ordered a hardware wallet, and you are ready to set it up. After a while, you are done, and you are left with a surprise. You realize that the device itself is not the most important thing. No! The most important thing right now is the piece of paper with your recovery phrase written on it. All this effort and eventually your early retirement is dependent on a piece of paper? No way! 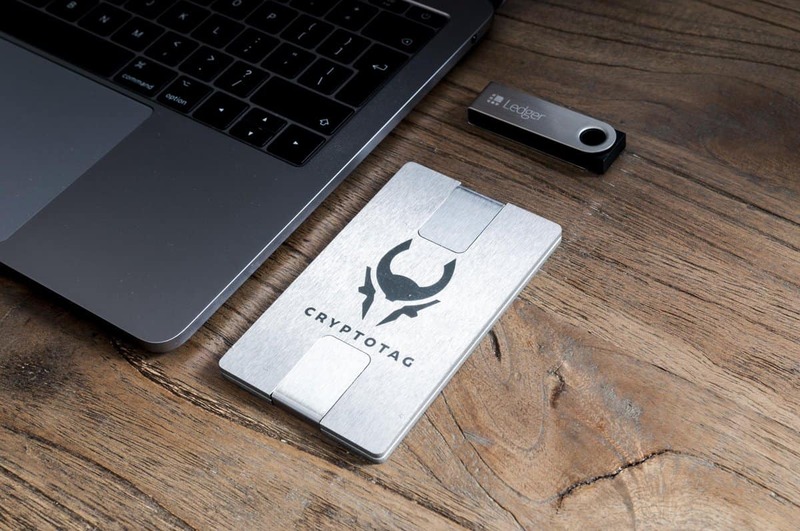 CRYPTOTAG closes the last line of defense with its premium backup system that enables people around the world to truly be their own bank by immortalizing their recovery phrases in titanium. The CRYPTOTAG handles extreme circumstances like no other. Temperatures up to 3050 °F / 1.668 °C, corrosion and extreme pressure are no problem. Extreme tests have been carried out on the product, and the 6mm thick Titanium is literally bulletproof. The Amsterdam based team has been testing different engraving methods and have developed a full backup system. During the development, they have been influenced by goldsmiths, metal workers, the aviation industry and old engraving techniques. These influences are visible in the components included such as the hammer, punching letters, anvil and the use of titanium.